Gateway Food Park will transform into a music hub with the #ATMKalayaan Rock Concert. Powered by Pinoytuner, it features top indie acts Autotelic and Mayonnaise, headlined by Ebe Dancel, and supported by the UP Music Circle Band. This free event will culminate as the clock strikes midnight on Independence Day. Registrants to the #ATMKalayaan concert on Araneta Center’s official FB page will take home treats from Universal Robina Corporation. Araneta Center has even more exciting offers for shoppers with its Independence Day Weekend Specials. Visit Gateway Mall, Ali MaCelebrate the spirit of Filipino freedom at Araneta Center with food, art and music events that are sure to entertain and rekindle your Pinoy pride! Taste the flavors of the Philippines at the center-wide food expo from June 10 to 12. This delightful food event will be held simultaneously at Gateway Mall, Ali Mall, and Farmers Plaza and showcase products from different regions at the malls’ respective activity area. On June 11, a boodle fight will ensue headlined by the Binibining Pilipinas queens at the Farmers Market; those who will register on the Binibining Pilipinas official Facebook page can participate. Love art? Visit the Araneta Center on June 11 at 10AM for a street mural painting activity at the Gateway Food Park. Watch local artists paint their interpretations of Philippine Independence on special installation provided by Megawide Construction Corporation, or grab your own paintbrush and unleash your inner Juan Luna! In conjunction with the Colors of the Philippines campaign of Davies Paints, participants also stand to take home goodies. ll and Farmers Plaza from June 10 to 12 and enjoy amazing shopping discounts. @Araneta Center Twitter followers will also get the chance to win P5,000 in cash by answering a question between June 6 to 12, posted with the hashtag #ATMKalayaan. With plenty of exciting events and exclusive offers all year round, Araneta Center is truly the place for freedom and fun-loving Filipinos! For more event updates and promos, visit its official website at www.aranetacenter.net. 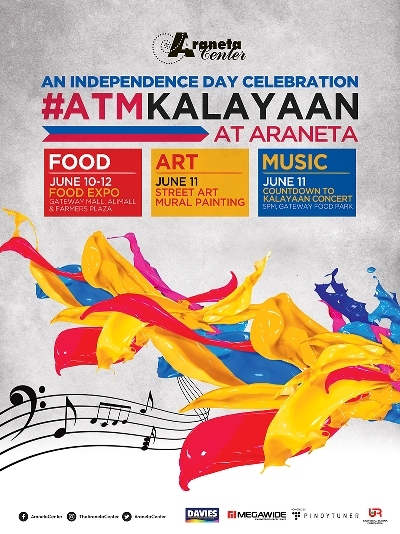 #ATMKalayaan center-wide event at the Araneta Center during the Independence Day weekend is brought to you by Davies Paints, Megawide, Universal Robina Corporation and Pinoytuner.